The drug-induced utopias of four Coney Island people are shattered when their addictions become stronger. THE REVIEW: I must have watched a different film than the one everyone else saw in class because the Requiem for a Dream I watched failed in many ways to live up to the realistic, addictive, and at times graphic depiction of Harry (Jared Leto) and Sara Goldfarb (Ellen Burstyn), Marion Silver (Jennifer Connelly), and Tyrone Love (Marlon Wayans) and the lives they live. Graphic is an apt descriptor, especially toward the end of the film which contains many cringe-worthy moments. But for the most part, Requiem for a Dream felt insincere and didn’t portray the addiction as well as it could have. Don’t get me wrong, Darren Aronofsky is quite stylized in his portrayal of drug use and addiction (which for Sara Goldfarb’s character takes the form of television and lusting over an ideal body figure). This specific style — which involves a lot of fast cutting, extreme close-ups on individual elements (e.g. needle, eyes dilating, blood cells), and “descriptive” sound effects — does work towards the end of the film, but at the beginning, it just feels out of place, disjointed, and cheesy. What got me the most were the sound effects which were way too over-the-top and in-your-face. They were hyperreal and akin to something a film student might pull from a standard sound effect library because they didn’t want to go out and record something new. For the montages of Harry, Marion, and Tyrone shooting up, the sounds created a hypnotic/rhythmic effect almost and sort of fit. But other sounds like chewing, walking, and fidgeting all felt extremely out of place and disruptive to the viewing experience. They didn’t help create a mood or an atmosphere that got you lost in the world of addiction, it took you out and tried to shove it down your throat. Up until the end, every part of the story and the characters are just presented to you with no cohesive purpose. I wondered quite often where the film was going and what I was supposed to be getting out of it. Requiem for a Dream hits you over the head with addiction; it’s clear this is the underlying message of the entire movie. But while the message is clear, how it’s going to be implemented is not. You can’t just show repeated scenes of kids shooting up or Sara mesmerized by the television all day; that doesn’t do anything. There needs to be some path, some driving force that moves things along. At the end you realize there was a point to all of this — it is about the destruction of these characters and the consequences each of their addictions inflicts upon them. Aronosky’s stylized view of this world really takes shape and the acting, especially from Ellen Burstyn, is phenomenal. You really see the effects of everything that’s been happening over the course of the film. But ten wonderfully entrancing minutes at the end of the film doesn’t make up for 90 minutes of garbage and incoherent nonsense at the beginning. There’s a lot more I didn’t like, or simply didn’t understand, about Requiem for a Dream. My other biggest complaint/annoyance is with the Tappy Tibbons (Christopher McDonald) show that Sara watches relentlessly throughout the film. I do see how the monotony and the repetition serves the point of the film, but for a film that many call “realistic” — again, I didn’t view this film as realistic — you’d think something other than Tappy Tibbons would be on the television at some point throughout the day. No channel in the world runs the same show 24/7 with no commercial breaks for some other product. There’s just too much Tappy Tibbons. 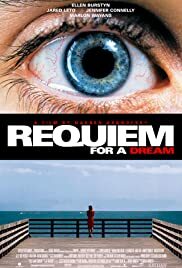 THE TAKEAWAY: Requiem for a Dream may be one of those films that I just don’t get. Everyone else in the class seemed to love this film and kept raving about how accurate and real it seemed. They found the portrayal of addiction to be done extremely well, albeit disgusting and cringe worthy at times, and the character’s descent to a point of no return to be painfully true to life. It may be that I see all this on a second viewing especially now knowing what to expect. But from what I saw, Requiem for a Dream was an incoherent, cheesy, and sloppy mess that, except for the very end, didn’t achieve it’s goal of telling a story about addiction with the same authenticity as other films.